Not only can ATMs be dangerous and should we watch out for ATM skimmers (see in the next section below), but today’s theft technologies can now also steal your credit card information via RFID chip, also known as electronic pickpocketing. See here how easily it’s done. Want to protect yourself from this type of theft? Check out these RFID protection sleeves. Would You Have Spotted the Fraud? Would You Have Spotted This ATM Fraud? 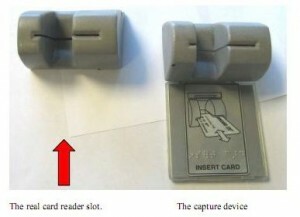 Pictured here is what’s known as a skimmer, or a device made to be affixed to the mouth of an ATM and secretly swipe credit and debit card information when bank customers slip their cards into the machines to pull out money. Skimmers have been around for years, of course, but thieves are constantly improving them, and the device pictured below is a perfect example of that evolution. 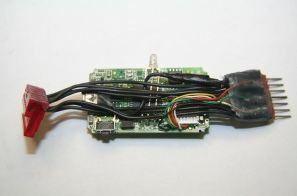 This particular skimmer was found Dec. 6, 2009, attached to the front of a Citibank ATM in Woodland Hills, Calif. Would you have been able to spot this? Real card slot on left, skimmer on right. The U.S. Secret Service estimates that annual losses from ATM fraud totaled about $1 billion in 2008, or about $350,000 each day. Card skimming, where the fraudster affixes a bogus card reader on top of the real reader, accounts for more than 80 percent of ATM fraud. Last week, I had a chance to chat with Rick Doten, chief scientist at Lockheed Martin‘s Center for Cyber Security Innovation. Doten has built an impressive slide deck on ATM fraud attacks, and pictured below are some of the more interesting images he uses in his presentations. 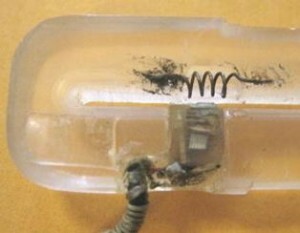 ATM PIN capture overlay device pulled back to reveal the legitimate PIN entry pad. The site also advertises a sort of rent-to-own model for would-be thieves who need seed money to get their ATM-robbing businesses going. “Skim With Our Equipment for 50% of Data Collected,” the site offers. The plan works like this: The noobie ATM thief pays a $1,000 “deposit” and is sent a skimmer and PIN pad overlay, along with a link to some videos that explain how to install, work and remove the skimmer technology. 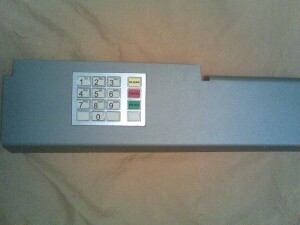 The backside end of a standard, $1,500 Diebold skimmer sold online. The truth is that most of these skimmers openly advertised are little more than scams designed to separate clueless crooks from their ill-gotten gains. Start poking around on some of the more exclusive online fraud forums for sellers who have built up a reputation in this business and chances are eventually you will hit upon the real deal. Operating and planting an ATM skimmer — cleverly disguised technology that thieves attach to cash machines to intercept credit and debit card data — can be a risky venture, because the crooks have to return to the scene of the crime to retrieve their skimmers along with the purloined data. Increasingly, however, criminals are using ATM skimmers that eliminate much of that risk by relaying the information via text message. Thieves recently attached bank card skimmers to gas pumps at more than 30 service stations along several major highways in and around Denver, Colorado, the latest area to be hit by a scam that allows crooks to siphon credit and debit card account information from motorists filling up their tanks. According to the European ATM Security Team (EAST), a not-for-profit payment security organization, ATM crimes in Europe jumped 149 percent form 2007 to 2008, and most of that increase has been linked to a dramatic increase in ATM skimming attacks. During 2008, a total of 10,302 skimming incidents were reported in Europe. Below is a short video authorities in Germany released recently showing two men caught on camera there installing a skimmer and a pinhole camera panel above to record PINs. The European ATM Security Team(EAST) found that 11 of the 16 European nations covered in the report experienced increases in skimming attacks last year. 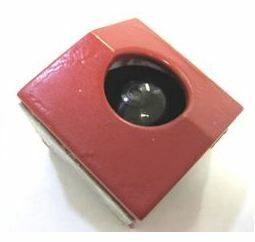 EAST noted that in at least one country, anti-skimming devices have been stolen and converted into skimmers, complete with micro cameras used to steal PINs. 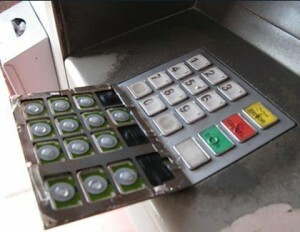 EAST said it also discovered that a new type of analogue skimming device — using audio technology — has been reported by five countries, two of them “major ATM deployers” (defined as having more than 40,000 ATMs). So, after locating an apparently reliable skimmer seller on an exclusive hacker forum, I chatted him up on instant message and asked for the sales pitch. This GSM skimmer vendor offered a first-hand account of why these cell-phone equipped fraud devices are safer and more efficient than less sophisticated models — that is, for the buyer at least (I have edited his sales pitch only slightly for readability and flow). 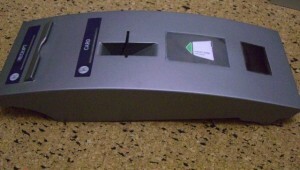 A GSM-based ATM card skimmer. I wasn’t sure whether I could take this person seriously, but his ratings on the forum — in which buyers and sellers leave feedback for each other based on positive or negative experiences from previous transactions — were good enough that I figured he must be one of the few people on this particular forum actually selling ATM skimmers, as opposed to just lurking there to scam fellow scammers. Media attention to crimes involving ATM skimmers may make consumers more likely to identify compromised cash machines, which involve cleverly disguised theft devices that sometimes appear off-color or out-of-place. Yet, many of today’s skimmer scams can swipe your card details and personal identification number while leaving the ATM itself completely untouched, making them far more difficult to spot. On February 8, 2009, a customer at an ATM at a Bank of America branch in Sun Valley, Calif., spotted something that didn’t look quite right about the machine: A silver, plexiglass device had been attached to the ATM’s card acceptance slot, in a bid to steal card data from unsuspecting ATM users. But the customer and the bank’s employees initially overlooked a secondary fraud device that the unknown thief had left at the scene: A sophisticated, battery operated and motion activated camera designed to record victims entering their personal identification numbers at the ATM. To combat an increase in ATM fraud from skimmer devices, cash machine makers have been outfitting ATMs with a variety of anti-skimming technologies. In many cases, these anti-skimming tools take the shape of green or blue semi-transparent plastic casings that protrude from the card acceptance slot to prevent would-be thieves from easily attaching skimmers. But in a surprising number of incidents, skimmer scammers have simply crafted their creations to look exactly like the anti-skimming devices. 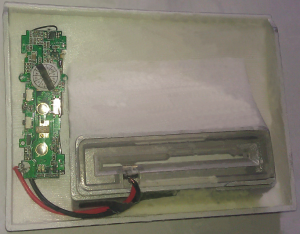 Most of the ATM skimmers I’ve profiled in this blog are comprised of parts designed to mimic and to fit on top of existing cash machine components, such as card acceptance slots or PIN pads. 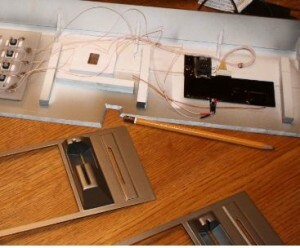 But sometimes, skimmer thieves find success by swapping out ATM parts with compromised look-alikes. Michaels Stores said this month that it had replaced more than 7,200 credit card terminals from store registers nationwide, after discovering that thieves had somehow modified or replaced machines to include point of sale (POS) technology capable of siphoning customer payment card data and PINs. The specific device used by the criminal intruders has not been made public. But many devices and services are sold on the criminal underground to facilitate the surprisingly common fraud. 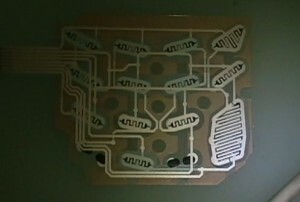 This paper-thin membrane fits under the real PIN pad. An ATM skimmer gang stole more than $400,000 using skimming devices built with the help of high-tech 3D printers, federal prosecutors say. Apparently, word is spreading in the cybercrime underworld that 3D printers produce flawless skimmer devices with exacting precision. In June, a federal court indicted four men from South Texas (PDF) whom authorities say had reinvested the profits from skimming scams to purchase a 3D printer. 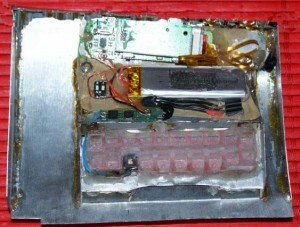 Almost a year ago, I wrote about ATM skimmers made of parts from old MP3 players. Since then, I’ve noticed quite a few more ads for these MP3-powered skimmers in the criminal underground, perhaps because audio skimmers allow fraudsters to sell lucrative service contracts along with their theft devices. The vendor of this skimmer kit advertises “full support after purchase,” and “easy installation (10-15 seconds).” But the catch with this skimmer is that the price tag is misleading. That’s because the audio files recorded by the device are encrypted. The Mp3 files are useless unless you also purchase the skimmer maker’s decryption service, which decodes the audio files into a digital format that can be encoded onto counterfeit ATM cards. Previous Microsoft Office Professional Plus 2007/2010/2013 encountered an error during setup. Next MIT has made a camera that can take 1 Trillion frames per second! There’s definately a great deal to learn about this issue. I really like all the points you’ve made. With Internet crime up and now this, no one is safe. Cool post! Now gotta watch out! Seriously wow these crooks are smart! Excellent post. Catch these crooks! I was just a victim and I don’t know how! Maybe now I do? 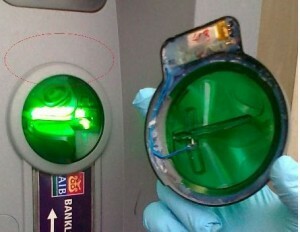 Nice post…Now-a-days the thieves are very smart and using advanced technology for ATM skimming. They breaks the law and perform illegal activities. They should be arrested to stop these kind of activities. I swear a gas station I previously went to had this installed their gas pump. I went inside to pay instead. Where can I purchase an ATM skimmer? lol? 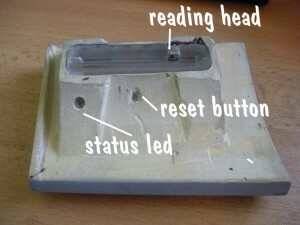 I do have for sale ATM Skimmer + Reader/Writer .